Trying to reach a younger audience through social media? You may want to think twice before heavily investing your budget into Facebook, as the social juggernaut is no longer number one among teen and young-adult users. We have been hearing this sentiment for quite some time now, but a recent poll from the data and research provider eMarketer is predicting some not-so-great news for Facebook in the coming years. The poll predicts that monthly users between the ages of 12-17 will fall 3.4% this year – nearly 14.5 million users. If true, this will be the second year of declining teen use for the Silicon Valley giant. Providing further evidence of Facebook’s lameness among teen users, youth marketing researcher YPulse, whose most recent Topline Report, does not even rank Facebook in the top three social networks used by 13-17-year-olds. There are a number of theories about why younger generations are leaving Facebook, or never even signing up for the social network in the first place – some may see it as the social network for their parents, some claim to be afraid of sharing personal information on the platform, and others do not see the social network as being very social. Over the past few years, Facebook has been trying to connect with younger audiences – introducing reactions, launching its failed teen-only Lifestage app, attempting to squash smaller rivals by playing competitive copycat or their next big venture attempt – original scripted programming. So far though, nothing has seemed to work for them. While this may sound like a doomsday scenario for Facebook, and should raise some red flags for the company, things are really not all that bad for Zuckerberg and co. yet. The social network still boasts 2 billion monthly users (far and above any other social network) and it also owns Instagram, which remains a strong favorite for Gen Z and Millennials. 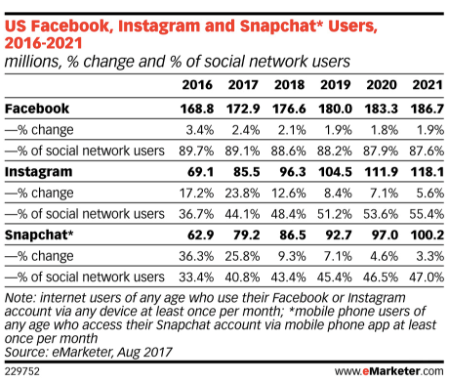 In fact, eMarketer predicts that Instagram should see its monthly users increase 23.8% over the next year and 12.6% in 2018. 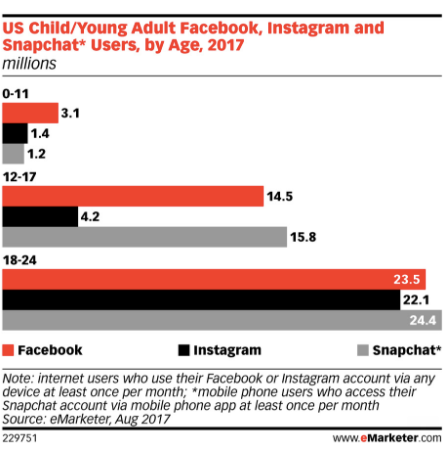 Unfortunately, this probably will not be enough to stop Snapchat from beating out Facebook and Instagram for the first time ever in monthly users for an age group. The social platform that seemingly everyone once scrutinized for its slow user growth and short-term content is now poised to take the top spot among Millennials and Gen Z users, with a possible and impressive 25.8% growth among all monthly social users and 19.2% among 18-24-year-olds in the next year. And therein lies the big takeaway that all marketers should already know to be true: content is key. While it is important to understand where your audience is, you should be aware what your audience wants and what kind of content they are more likely to engage with. For Gen Z and Millennials, it’s visual, and that is just not what Facebook is right now- especially after such a polarizing and turbulent election year, which seems to have made Facebook the place to see pollical commentary and less wanderlust. This love for visual content has made brands rethink their strategies not only on social media, but in the real world. Successful brick and mortars, like Glossier’s New York store, are focusing more on becoming an experience for shoppers as opposed to just another cookie-cutter store in the mall, and hotels like Hilton have started catering to younger guests by making their rooms and facilities more “Instagramable”. Brands have also found it easier to engage with their fans on visual-based social networks like Instagram. A great recent example is Disney, who launched their Dream Big Princess campaign in an effort to flip the princess stereotype on its head, and Vans has been turning their own audience into influencers by repurposing their content on its VansgGrls Instagram channel. Snapchat is also allowing brands to bring digital marketing into physical space. Adidas, Gatorade, and Universal have also started to experiment with Snapchat’s New Snap To Unlock feature, which uses QR codes disguised as Snap Codes to be placed on anything from product packaging to store walls. When scanned through the app, users are taken to a special landing page and given access to an exclusive filter for 24 hours. It will be interesting to see how these younger generations behave digitally in the future. Right now they are searching for visual content, instant gratification, and experiences. As they grow up, begin college and move away from their core group of current friends, will they become more engaged with Facebook, or will Facebook be the one to change and provide them with the content that they crave? Either way, Facebook isn’t going anywhere anytime soon. It is evident that they’ve been preparing for the inevitable for some time, and I would find it hard to believe that Mark Zuckerberg could think that Facebook could stay on top forever – because no one ever does. Strong and smart investments into Instagram, Oculus and the internationally-popular WhatsAPP , as well as massive amounts of user data and a heavy venture into artificial intelligence have ensured that the social giant will almost certainly not end up becoming the next MySpace, Friendster, or Xanga. However, right now, Facebook is def not the cool place to be if you’re a teenager. If you need help determining which social media platform is best for your business, contact Anvil, we are happy to help!